You can create a template out of many assets in your project. You can create a template out of one or several panels, one or several layers in a panel, a sound clip, a video clip and even animation keyframes. Creating a template is as simple as selecting the assets you want to store in the template, then dragging and dropping them into a library in the Library view. In the Library view, select a folder in which you want to store your template. While holding Shift, click on the first layer you want to add to your selection, then on the last layer you want to add to your selection. All layers in-between will be part of the selection, inclusively. While holding Ctrl (Windows) or ⌘ (macOS), click on each layer you want to add to your selection. Drag and drop the selection into the right pane of the Library view. In the Rename dialog box, enter the name for your new template. NOTE You can also rename a template after it is created by right-clicking on it and selecting Rename. While holding Shift, click on the first panel you want to add to your selection, then on the last panel you want to add to your selection. Every panel in-between will be part of the selection, inclusively. While holding Ctrl (Windows) or ⌘ (macOS), click on each panel you want to add to your selection. Click and drag on the drag and drop handle of one of the selected panels, then drop the selection into the right pane of the Library view. Drag and drop the selected panels into the right pane of the Library view. In the Timeline view, select a video or sound clip. Drag and drop the selected clip into the right pane of the Library view. 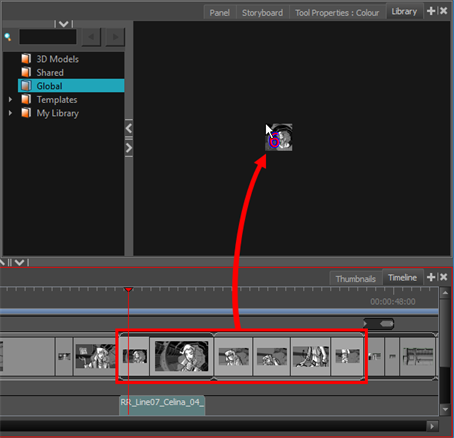 In the Timeline view, select the scene containing the camera movement. The camera's animation keyframes will appear in the Camera track of the Timeline view. To select all the keyframes in the animation, double-click on one of the keyframes or on the space between one of the keyframes. To select a series of keyframe, click on the first keyframe in the series then, while holding Shift, click on the last keyframe in the series. To select each keyframe individually, click on the first keyframe you want to select then, while holding Ctrl, click on each keyframe you wish to select. Do one of the following to copy the keyframes to the clipboard. In the top menu, select Edit > Copy Camera Keyframes. In the Library view, select the folder in which you want to store your template. In the top menu, select Edit > Paste. In the Timeline view, select the panel containing the animation. In the Layer list of the Stage or Camera view, select the layer containing the animation. 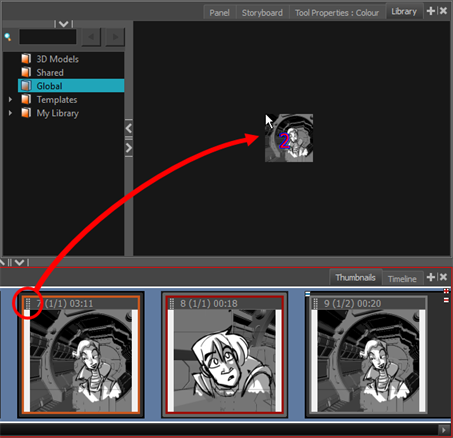 The layer's animation keyframes will appear in the Layer track of the Timeline view. 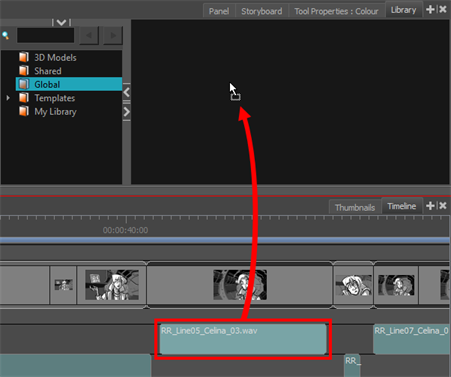 In the top menu, select Edit > Copy Layer Keyframes.